Cardiff’s undefeated Craig Kennedy will now box Edinburgh’s dangerous Stephen Simmons for the vacant British cruiserweight title at Motorpoint Arena Cardiff on Saturday March 11, live and exclusively on Channel 5, sponsored by Maxi-Nutrition. Original opponent Matty Askin injured his hand in sparring at the weekend and has now been ruled out for the March 11 clash, with Scotland’s experienced Simmons stepping in to take his place, in what looks like a cracking 50/50 contest at the Motorpoint Arena on March 11. TICKETS TO KENNEDY vs SIMMONS ARE ON SALE NOW AND ARE PRICED £42 AND £62, AVAILABLE FROM MOTORPOINTARENACARDIFF.CO.UK & WWW.TICKETMASTER.CO.UK OR CALL 029 2022 4488. The unfortunate tendon injury to Matty Askin’s hand has led to the BBBofC approving replacement Stephen Simmons to challenge Kennedy for the vacant British cruiserweight title. This vacant title fight promises to be a toe-toe battle between two of Britain’s best cruiserweights on a huge weekend for Welsh sport in the capital Cardiff, as Wales play Ireland in the Six Nations Rugby the night before (Friday, March 10) at the nearby Principality Stadium. Hometown hero Craig Kennedy will be looking to make it a Welsh double triumph that weekend when finally gets his shot at the British title against Edinburgh’s teak-tough Simmons. Both men will fancy their chances in this intriguing vacant British cruiserweight title bout with Simmons having the edge in terms of experience while the undefeated Kennedy is carrying some career best form into the March 11 contest. Cardiff’s Craig Kennedy is not only one of the best cruiserweight’s in the land, he’s also undoubtedly one of the most popular. The IBF International champ, 16(8)-0, will hope to benefit from his fanatical home support when he faces off against proven operator Simmons on March 11. Kennedy’s impressive undefeated record includes wins over Liverpool’s former British and Commonwealth title challenger Courtney Fry and Belgium’s big-punching Joel Tambwe Djeko, both of whom were outpointed by the talented Cardiff boxer, in June 2015 and May 2016 respectively. Simmons, 15(7)-2, is the former Celtic and WBC International Silver cruiserweight champion and gets his first shot at the British title following a career best performance in Germany against World rated Noel Gevor, which ended in a controversial split decision loss for the WBO International cruiserweight title. The thirty-two year old Simmons has been in with some of Britain’s and Europe’s best and knows how to beat an undefeated opponent, as he did against previously unbeaten German David Graf in 2013 for the vacant WBC International Silver title. 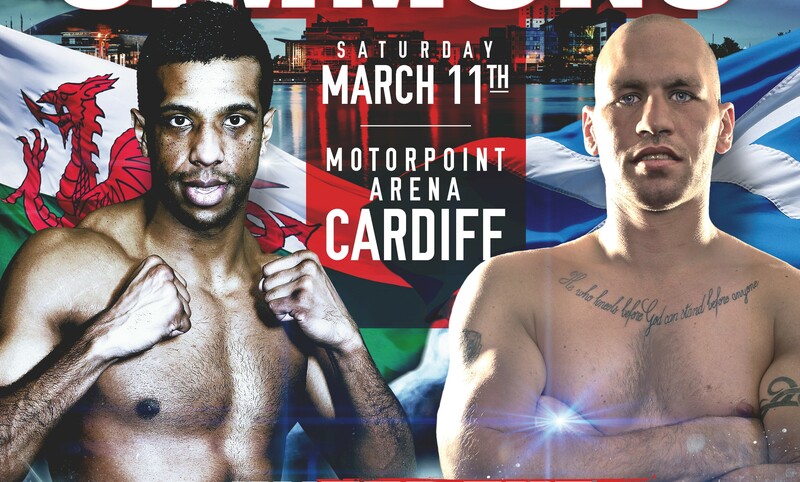 The scene is set for a classic British title showdown between two of the best cruiserweight’s in Britain on March 11 at Motorpoint Arena Cardiff. The undercard for Kennedy vs Simmons is packed full of the best Welsh and Irish boxing talent. Aberdare’s experienced heavyweight contender Dorian Darch faces off against Surrey’s undefeated Nick Webb, 10(9)-0, one of the brightest talents on the British heavyweight scene. This eight-round heavyweight contest is a classic prospect vs veteran encounter that should provide fireworks for the Motorpoint Arena Cardiff crowd. Also featuring on the stacked Cardiff bill will be Aberdare’s undefeated Morgan Jones, 9(3) – 0, who takes a big step up in class against Libya’s undefeated Malik Zinad, 8(7) – 0, in an international 8×3 mins light heavyweight contest. This clash of stylish undefeated prospects will feature on the live Spike UK undercard broadcast on March 11. Ebbw Vale’s talented bantamweight contender Ashley Brace faces her biggest test yet as a pro when she takes on Hungary’s former two-time world title challenger and IBF #10 ranked bantamweight contender Alexandra Vlajk in an international 8×2 mins contest. Other local talent on the big Kennedy vs Askin undercard includes Cardiff’s undefeated 2014 Commonwealth Games bronze medalist Nathan ‘Thunder’ Thorley, as well as Aberdare’s big Dorian Darch, Barry’s popular Jason Sillett and John O’Kelly. Blaenavon’s unbeaten super welterweight Mason Jones also features on the big March 11 bill while Garnant’s former British title challenger and WBC International champion Chris Jenkins, 16-2-1, boxes for the first time in Cardiff since 2014. Doors will open at 5pm at the Motorpoint Arena, Cardiff on Saturday March 11, with boxing commencing at 5.30pm.